If you make an OKCupid account but never check it because you only get messages from self-proclaimed Nice Guys/the entire endeavor fills you with existential dread, the site will attempt to reel you back in by telling you how hot and elite you are. 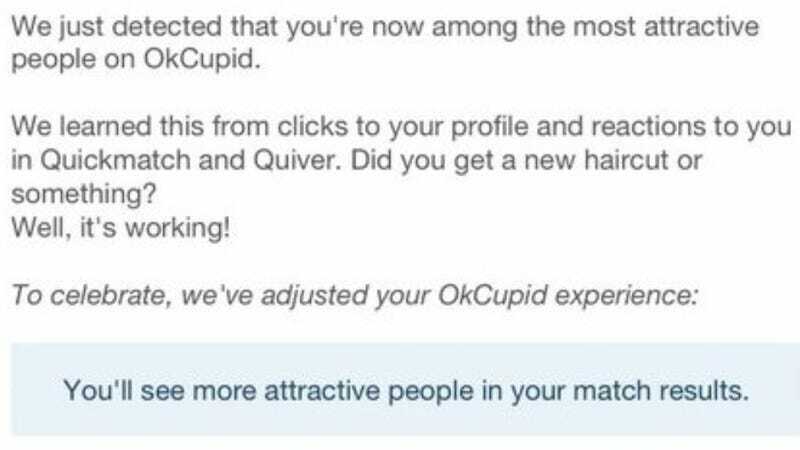 Business Insider points out what you might already know: some OKC users get emails encouraging you to take a new, more hopeful look around at the hottest users possible, only available for perusal by a hottie such as yourself. It reminds me of what happens if you try to quit Facebook: you're shown photos of all your best friends and exes so you'll feel nostalgic and reconsider your decision since everyone knows that, without Facebook, you'll die alone eaten by squirrels. Let's all move to a farm?